There are many health and fitness gadgets on the market at the moment, but the Bodybugg has been designed specially with calorie counting in mind. Lots of the health and fitness gadgets we’ve written about over the past few months have a calorie counting element, like the FitBit Ultra, but very few use a number of different metrics and provide truly accurate data. 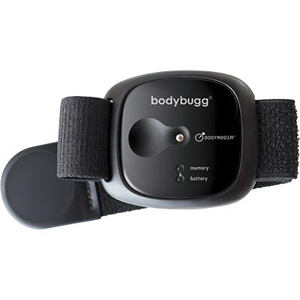 Well now BodyMedia has developed the Bodybugg, a gizmo specially made for keeping a close (and super accurate eye) on the calories you take in and go on to burn. The Bodybugg uses a kind of technology called ‘sensor fusion’, which looks at a number of physiological sensors, like heart rate, a pedometer, accelerometer and a heat sensor too. The gadget is great for those who enjoy tracking their health and fitness but really want to burn off a few pounds in the process. It doesn’t just guess how many calories you’ve roughly burned like similar gadgets, but instead it claims to be “the most accurate device on the market today for measuring calorie expenditure outside of a clinical setting.” It’s also quite sleek and wearable too, which is necessary if users are going to use it regularly. Available from 24 Hour Fitness starting at $179.